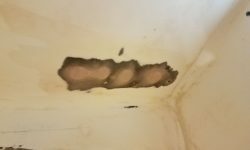 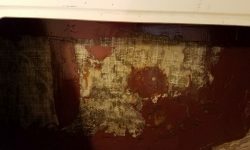 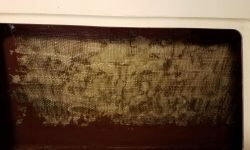 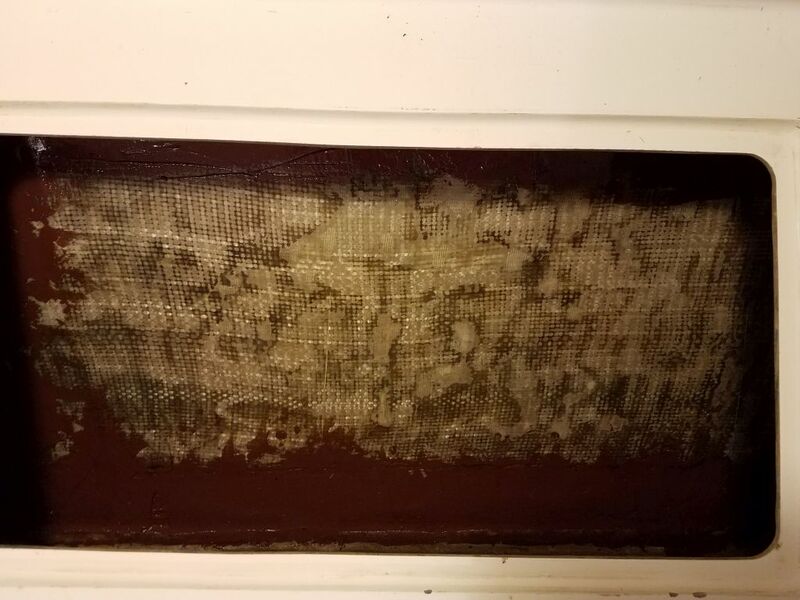 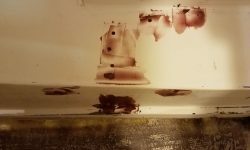 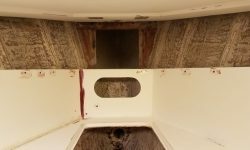 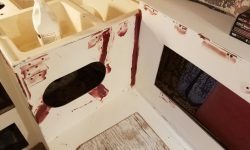 To begin, I cleaned up the interior pretty thoroughly, vacuuming and then solvent-washing as needed to prepare all the surfaces for epoxy filler. 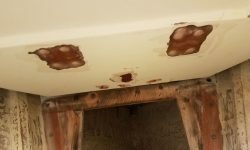 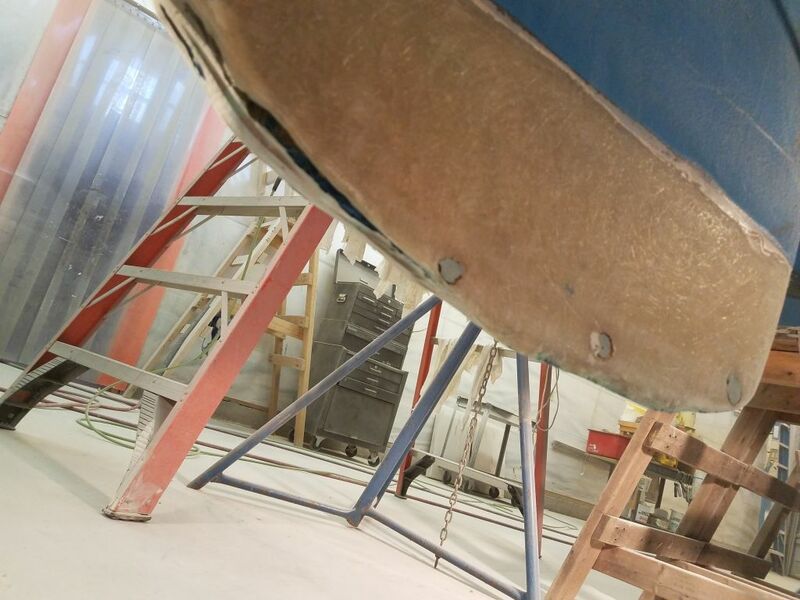 Once clean, I went around the boat and applied a coat of filler to the fastener holes and other areas I’d prepared. 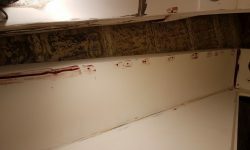 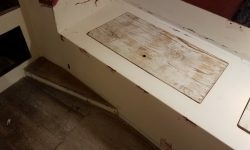 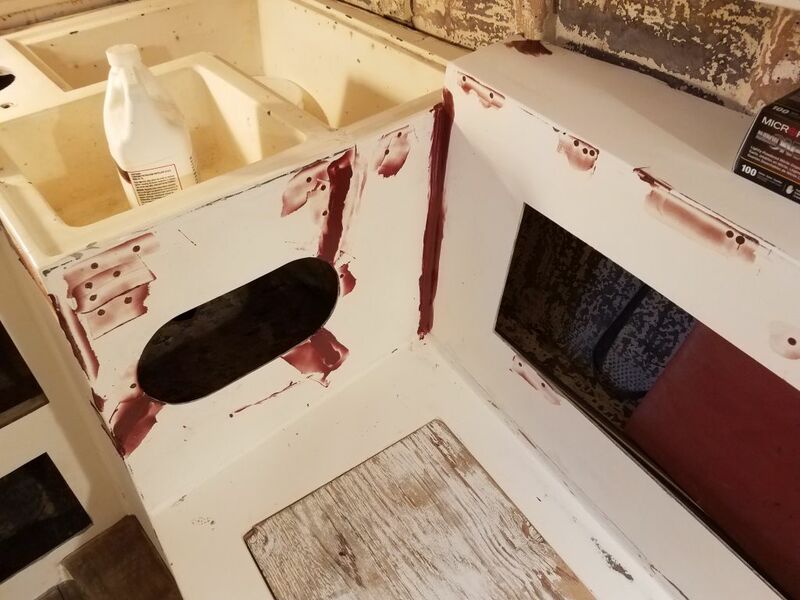 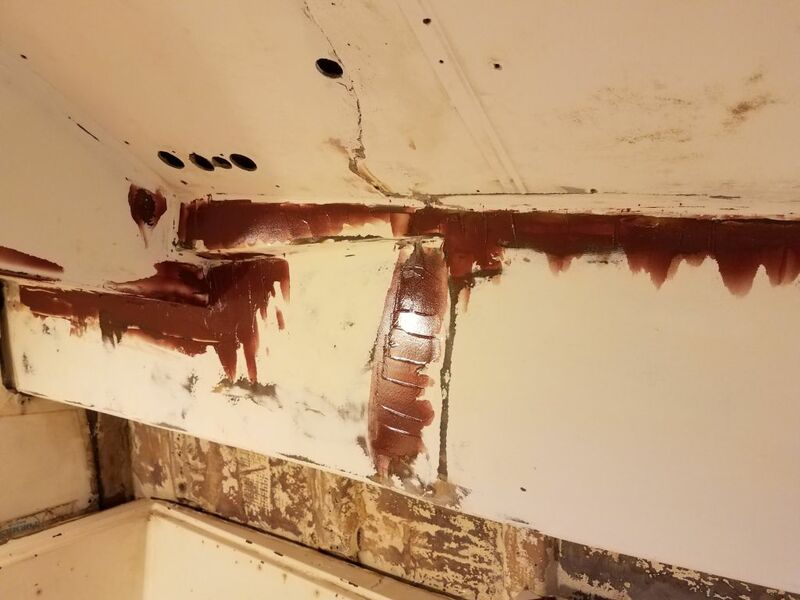 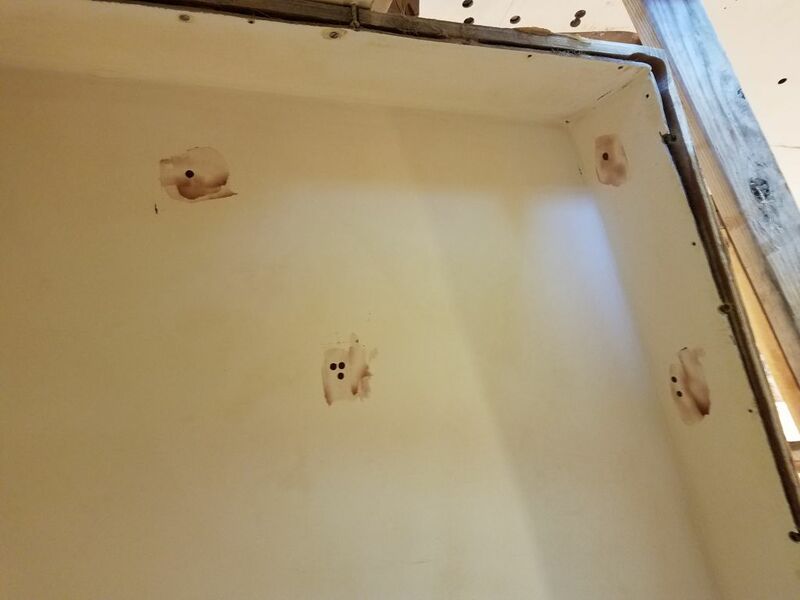 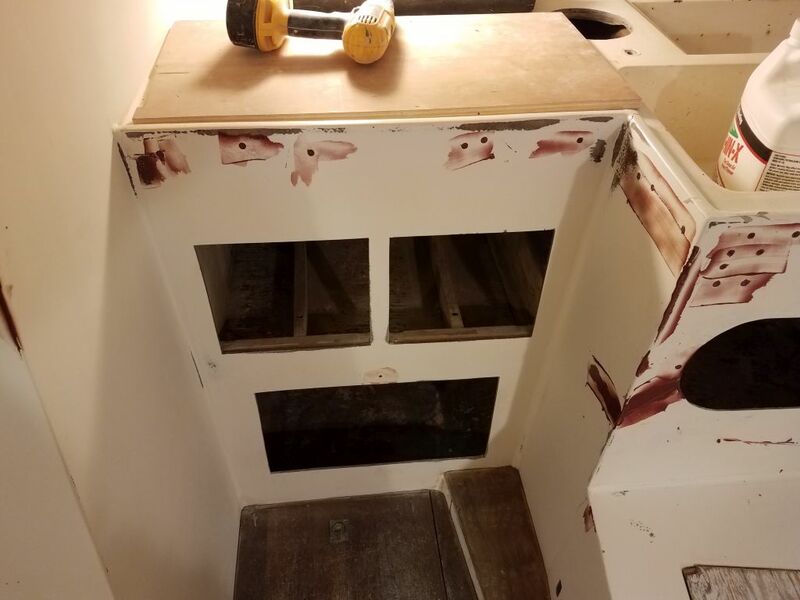 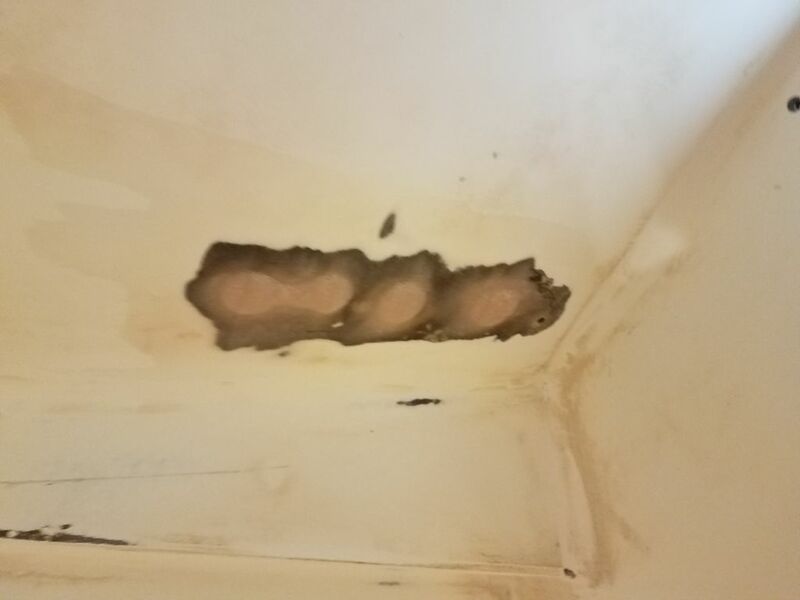 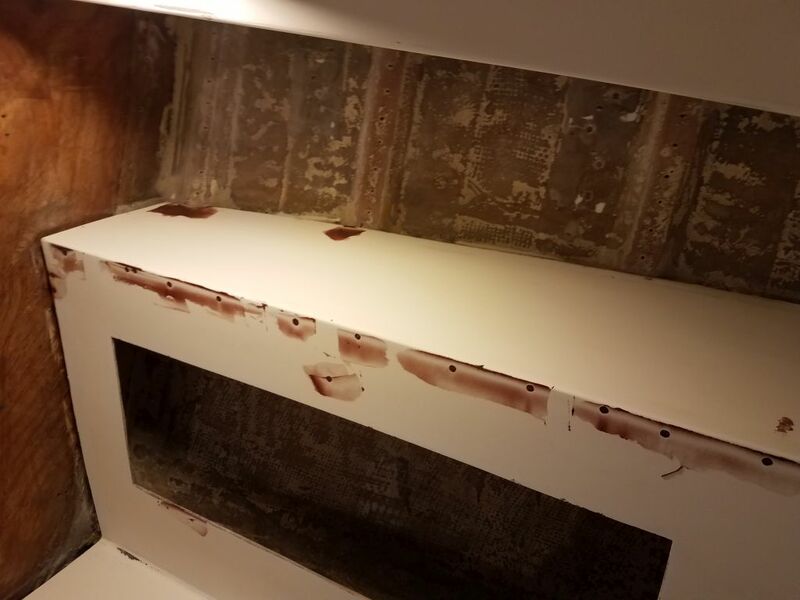 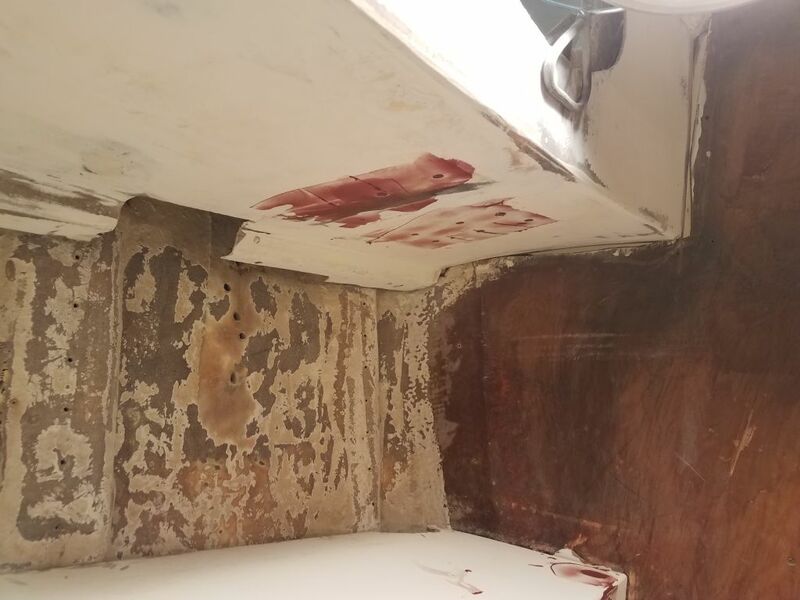 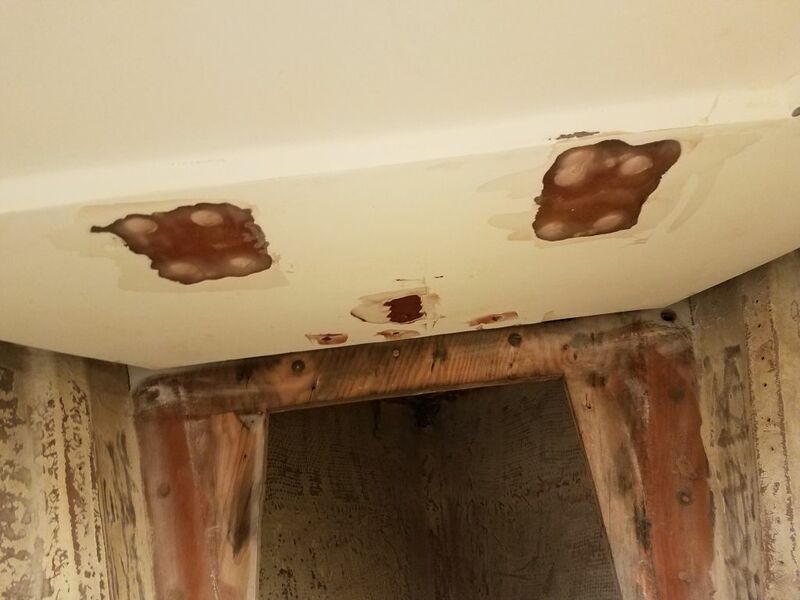 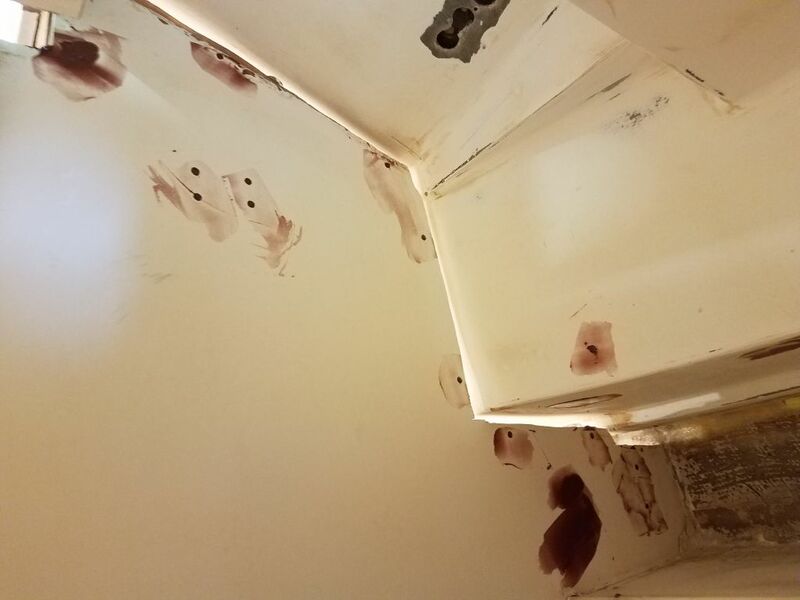 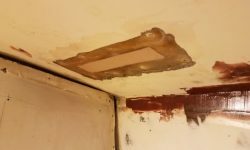 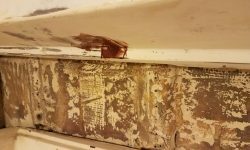 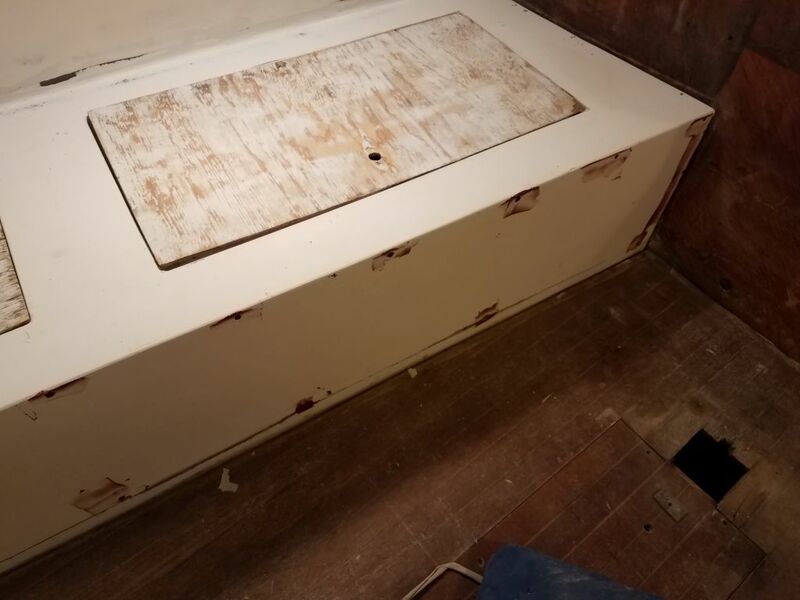 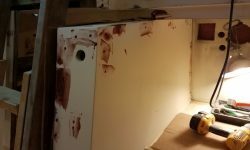 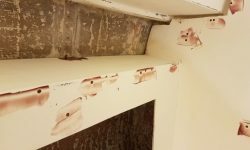 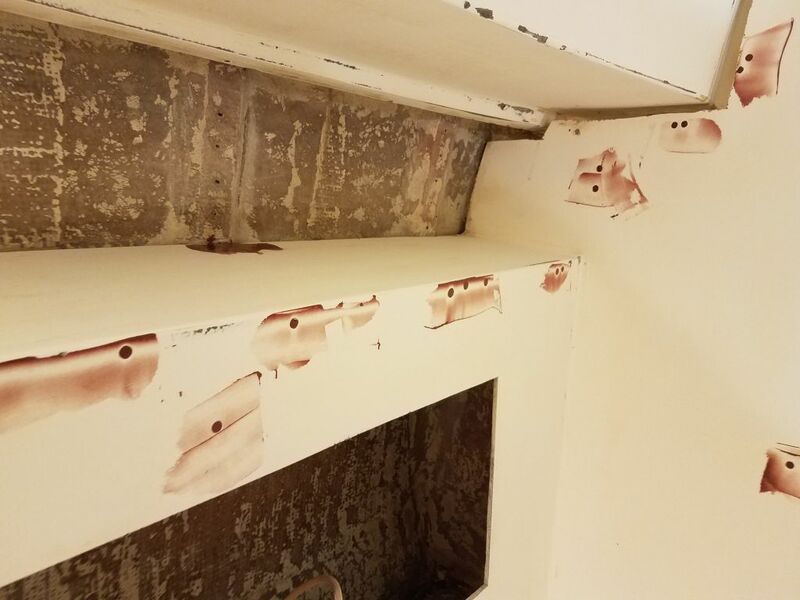 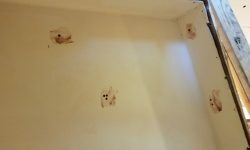 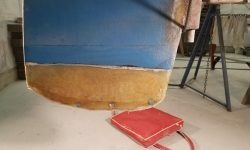 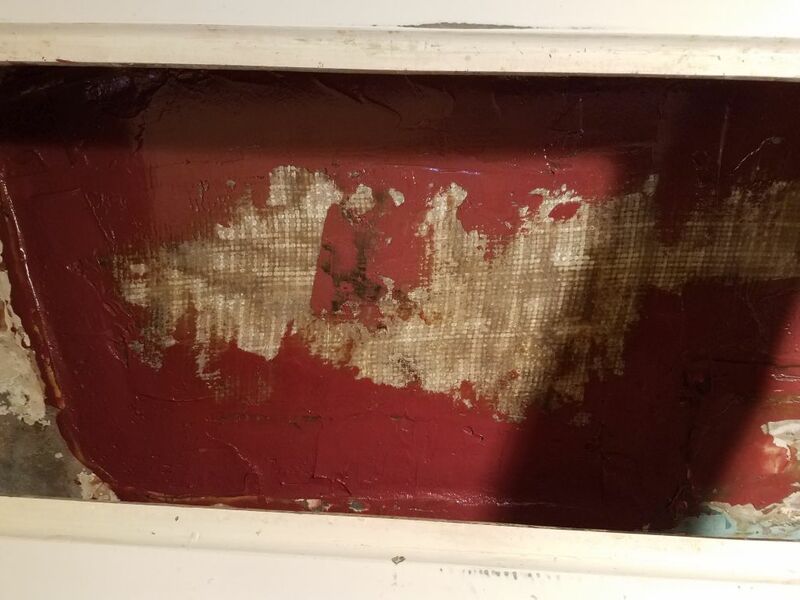 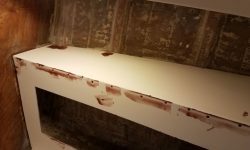 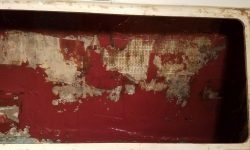 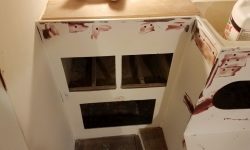 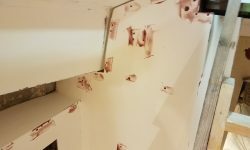 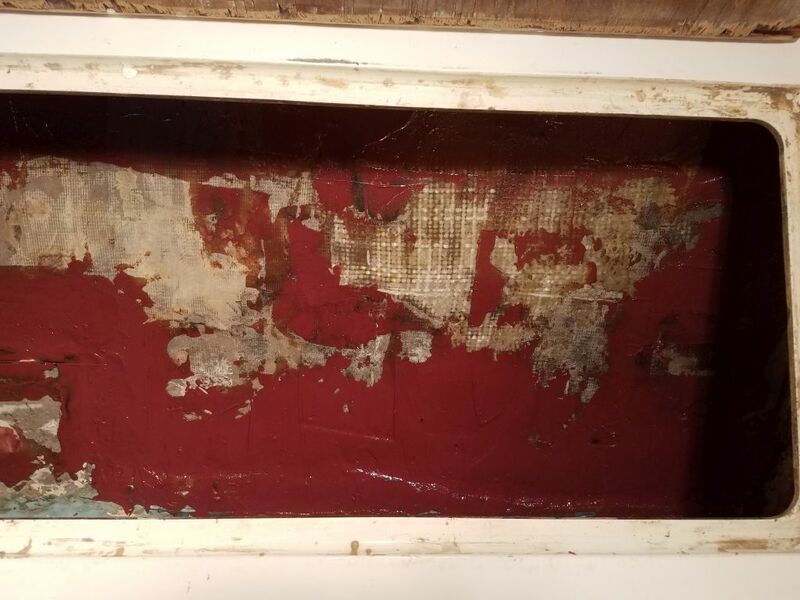 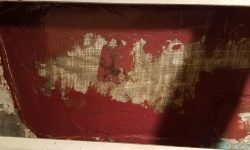 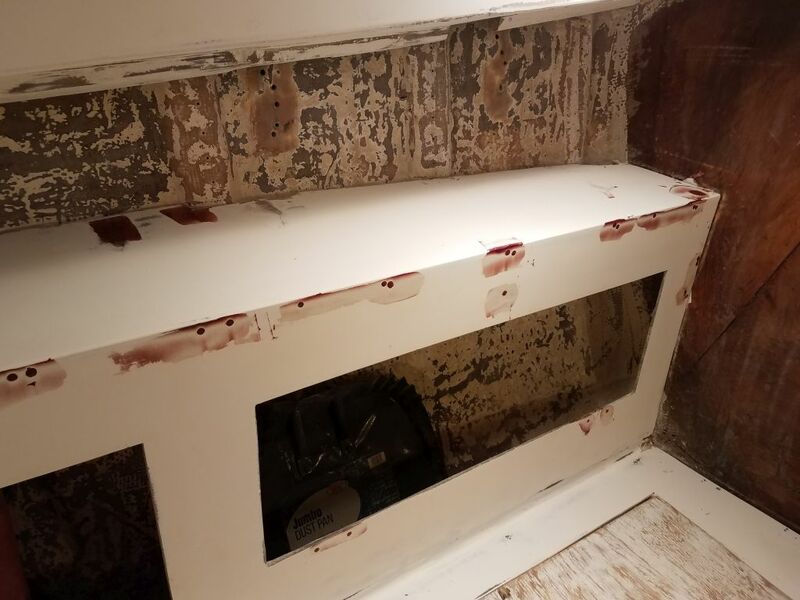 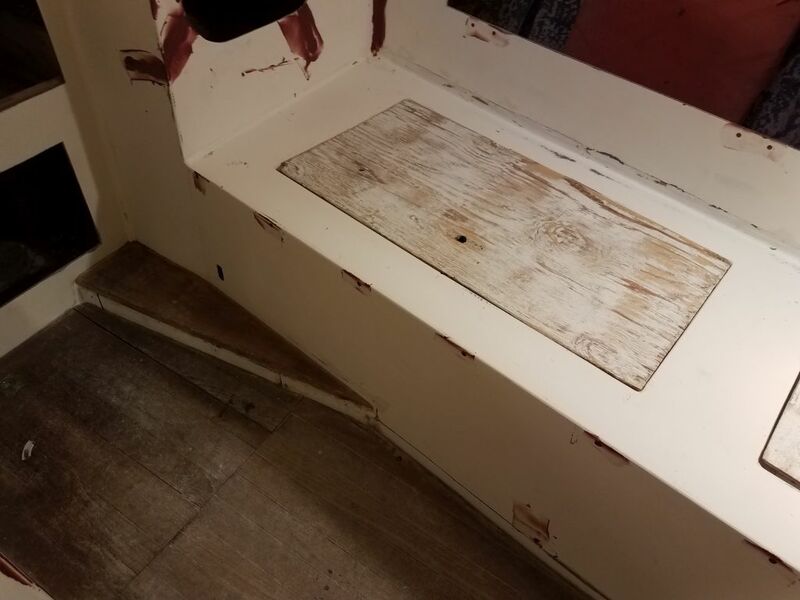 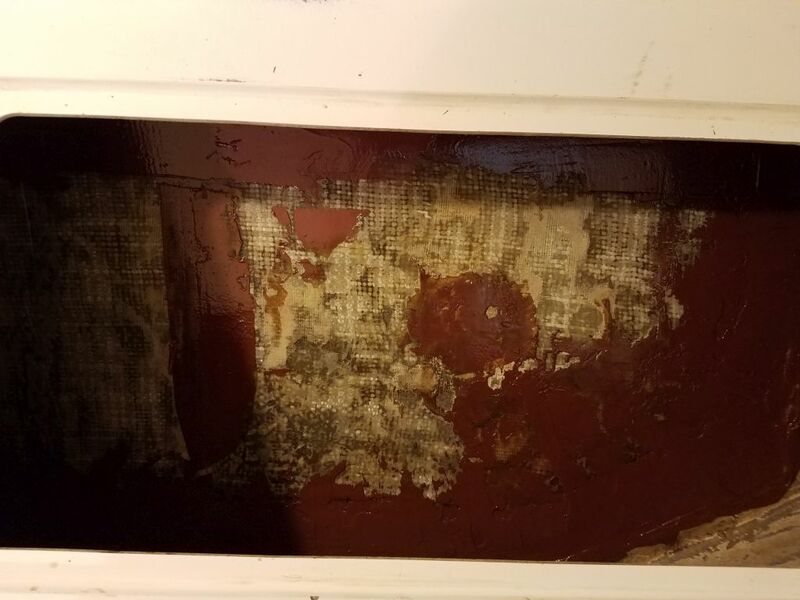 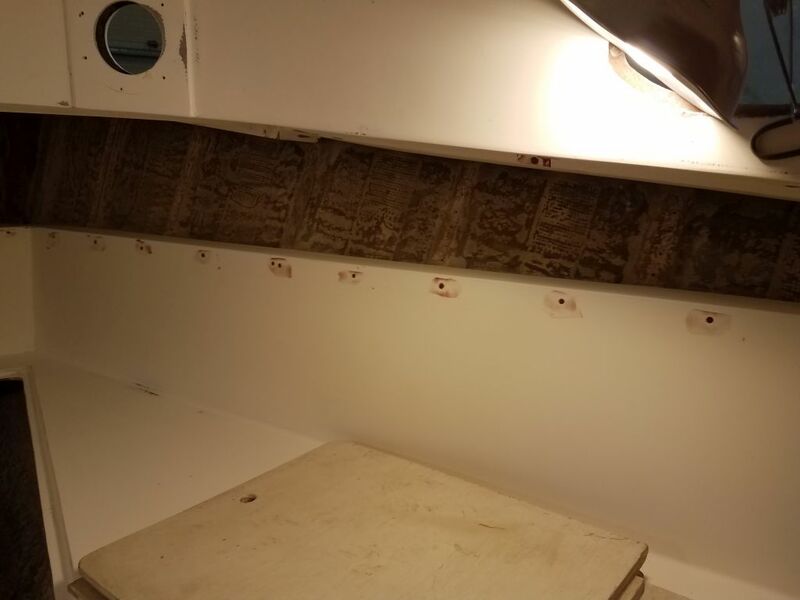 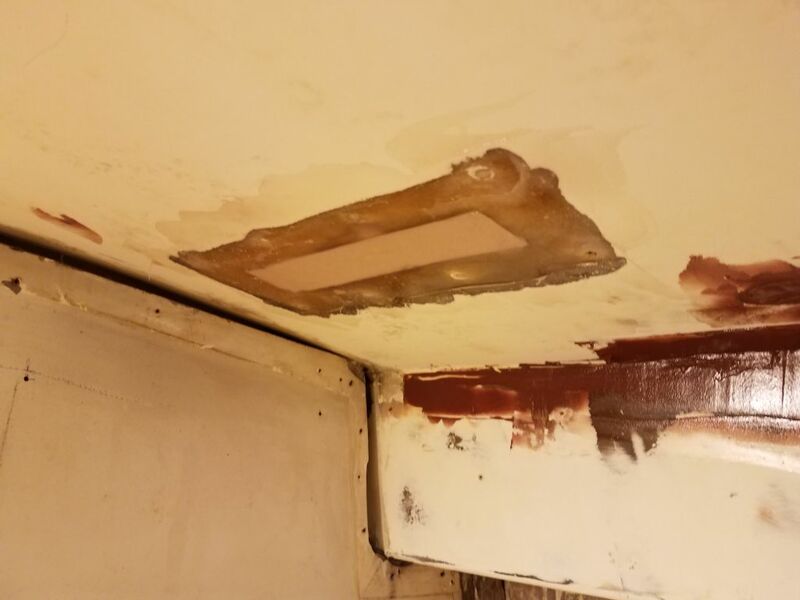 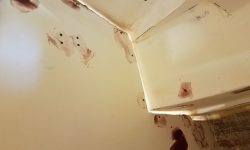 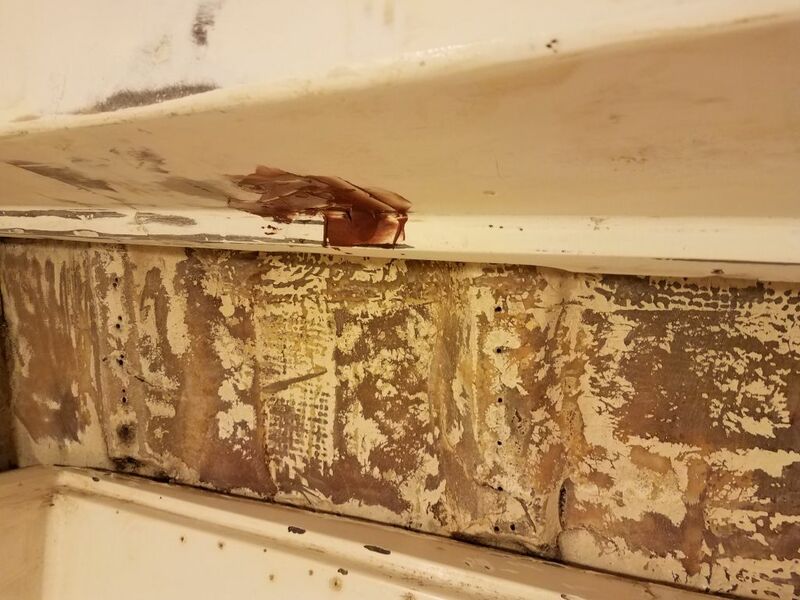 In the lockers beneath the settees, where I’d removed that old core material, there remained an edge around the insides of the lockers leftover from the old fiberglass, and, having sanded it as far as practicable, I used some epoxy filler to smooth out the transition. 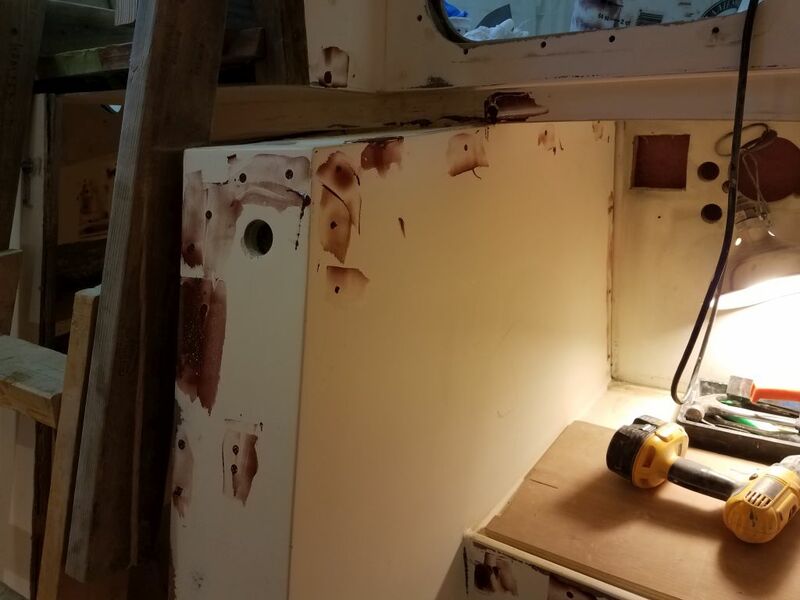 not going crazy with the process since these were only storage lockers. 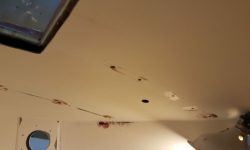 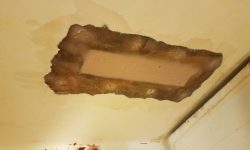 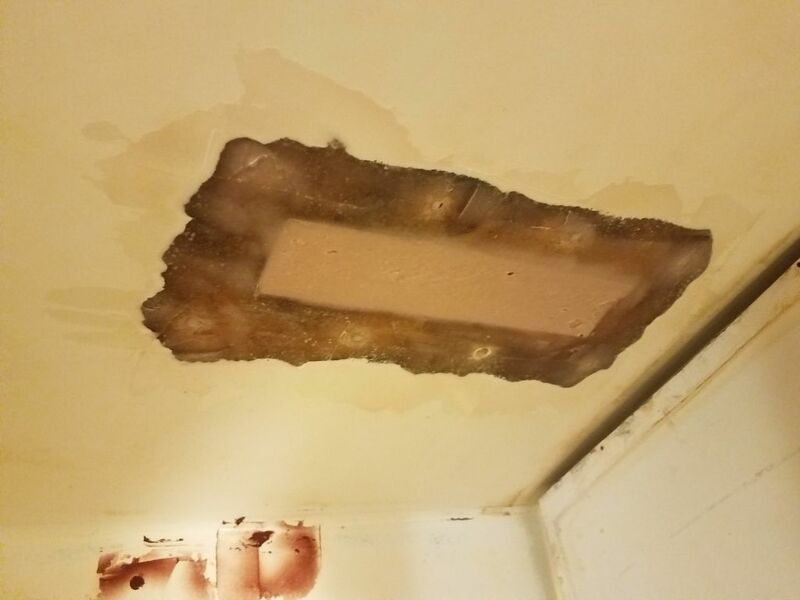 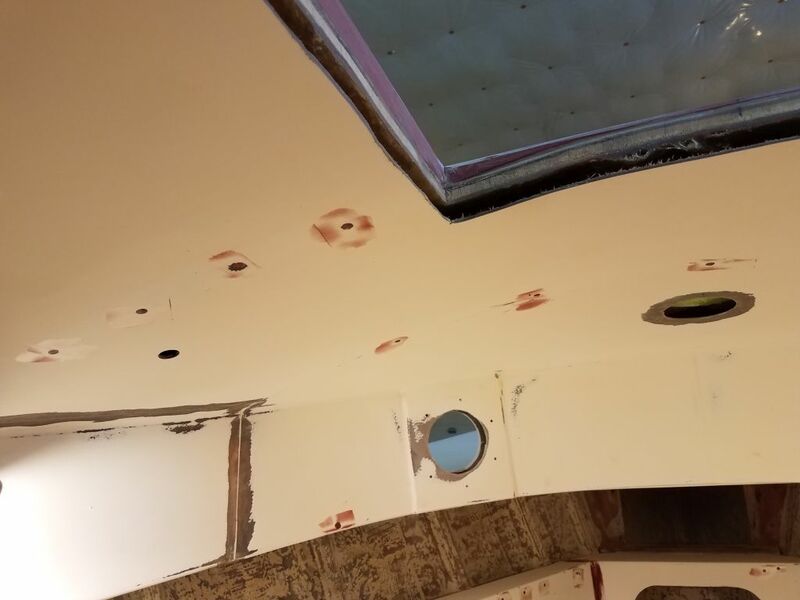 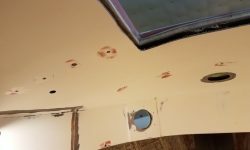 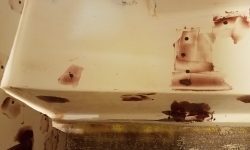 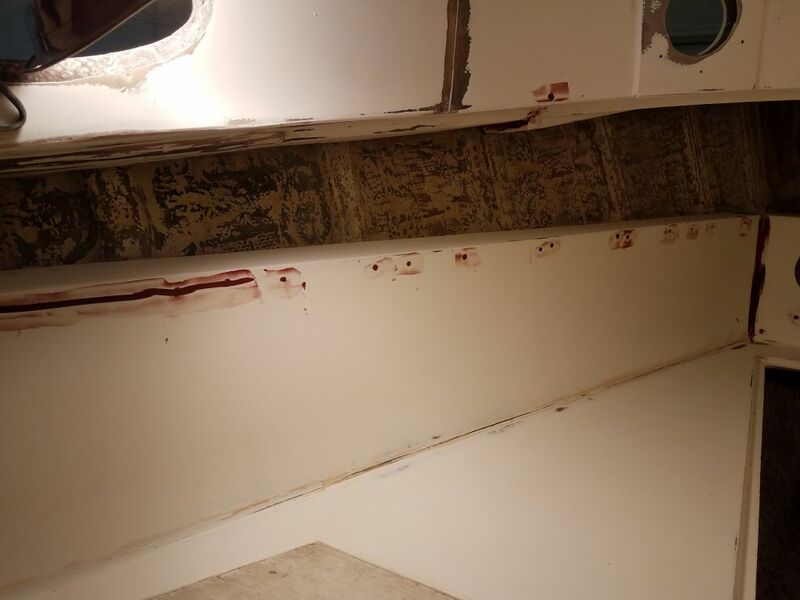 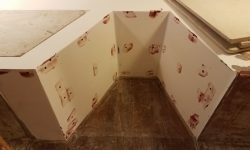 In the overhead in the galley and head, I filled the shallow voids left from the deck prism patches I’d installed on the deck side during the bridgedeck recore with a strengthened epoxy mixture, bringing the center areas flush with the surrounding fiberglass that I’d prepared. 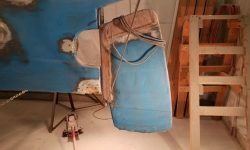 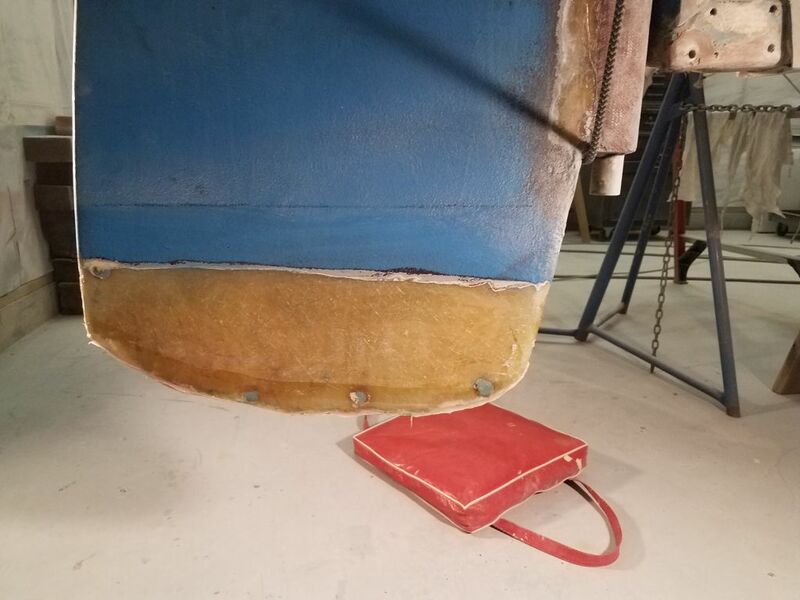 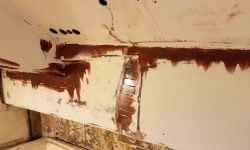 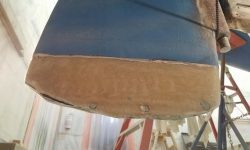 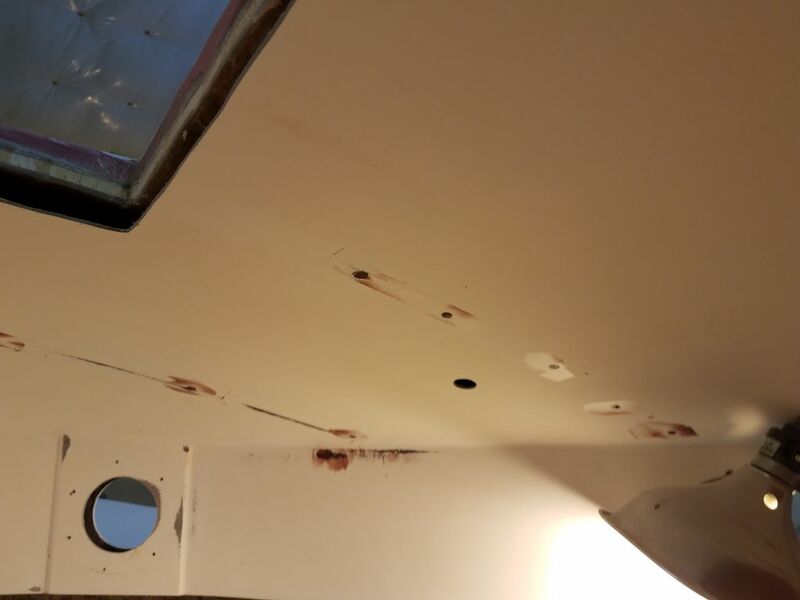 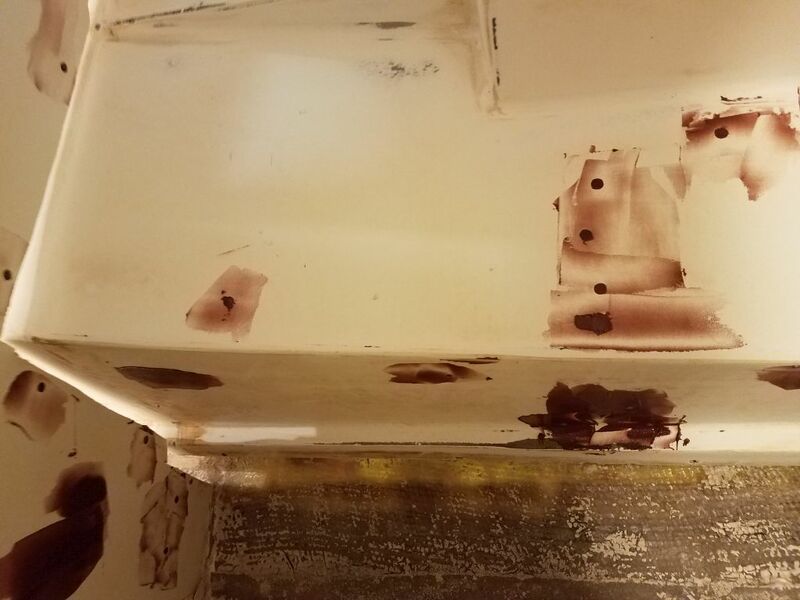 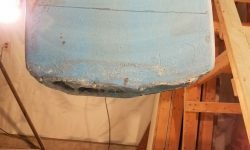 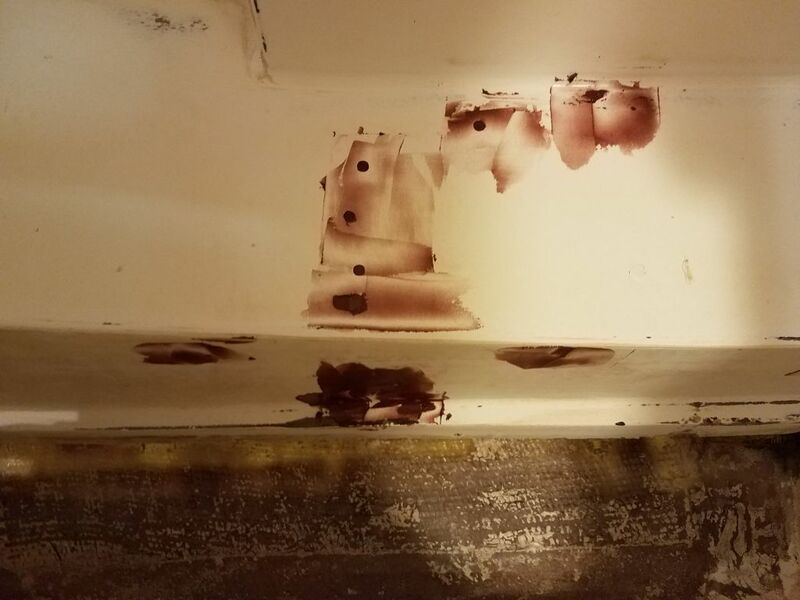 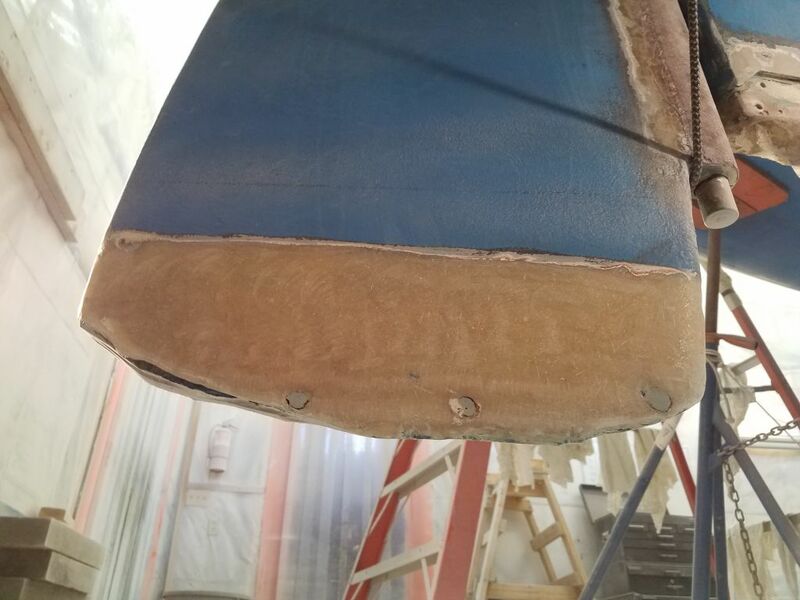 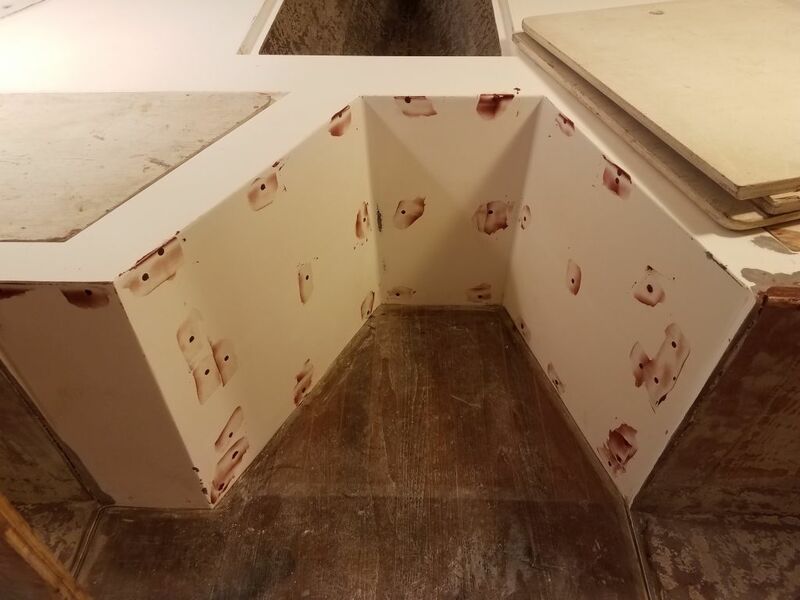 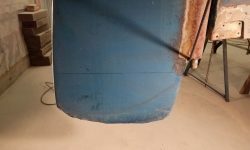 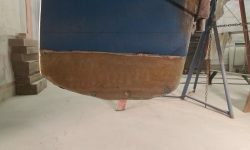 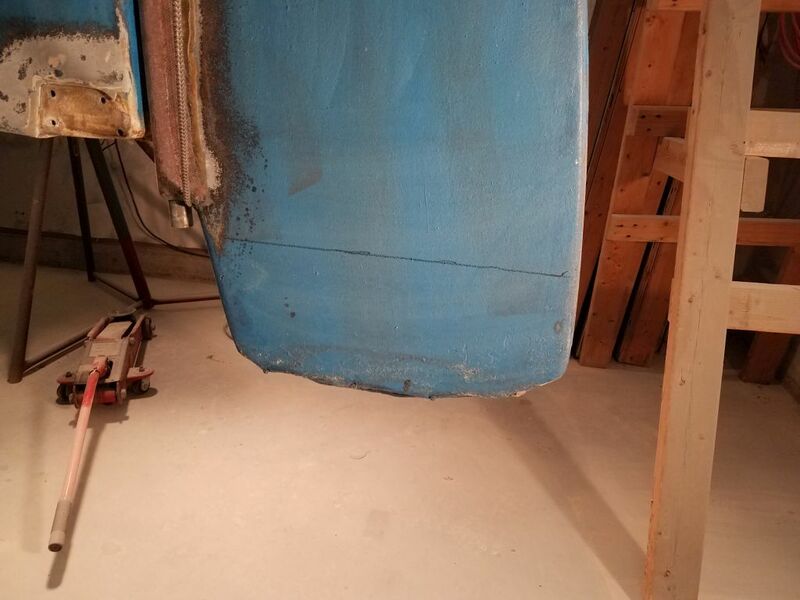 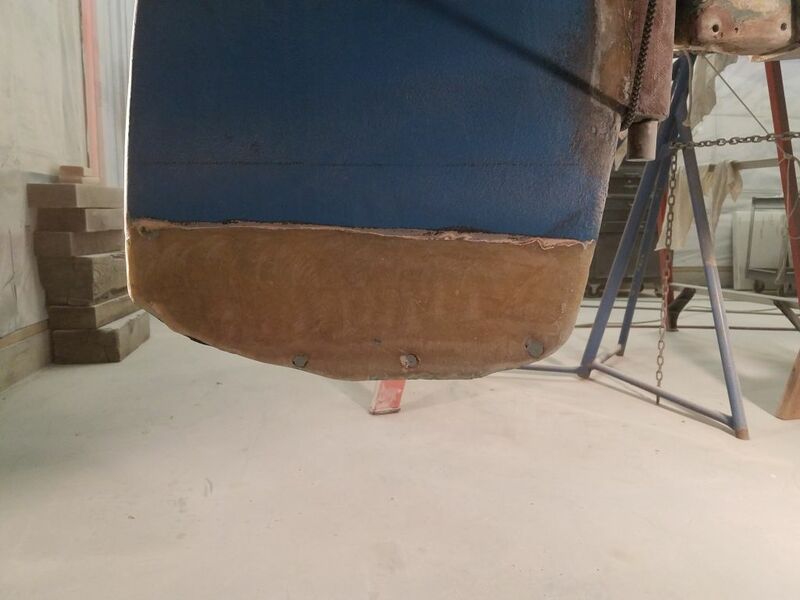 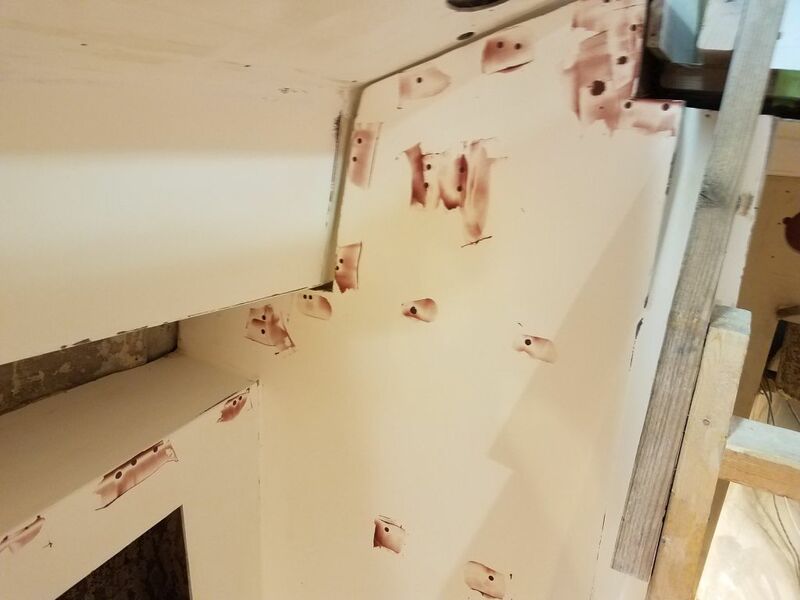 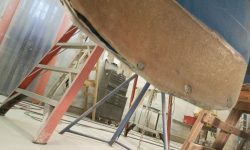 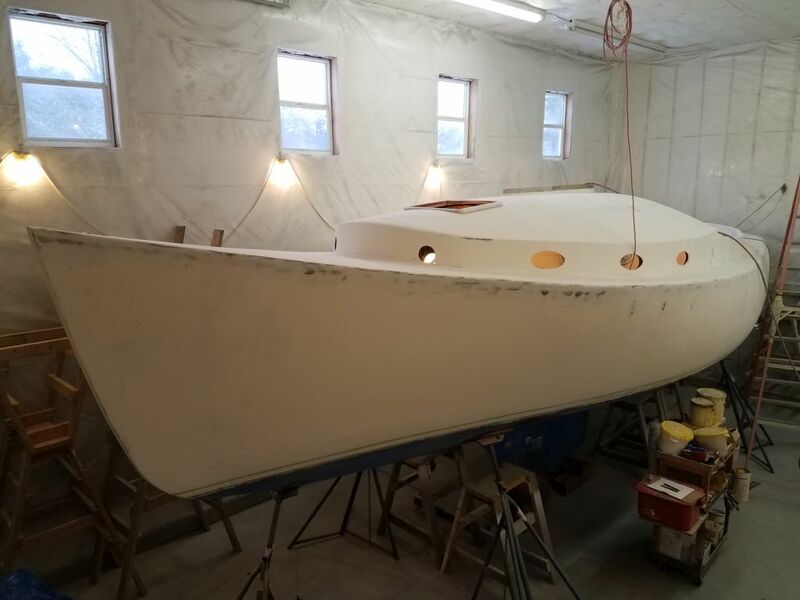 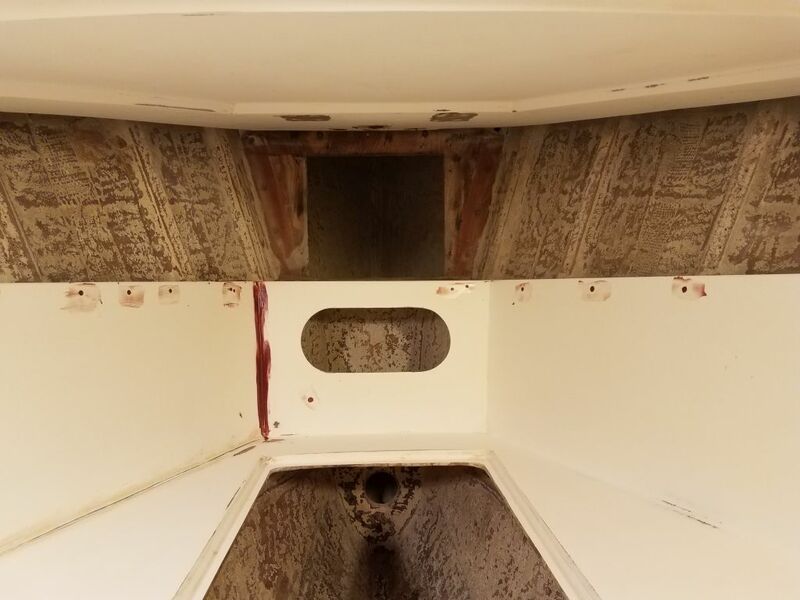 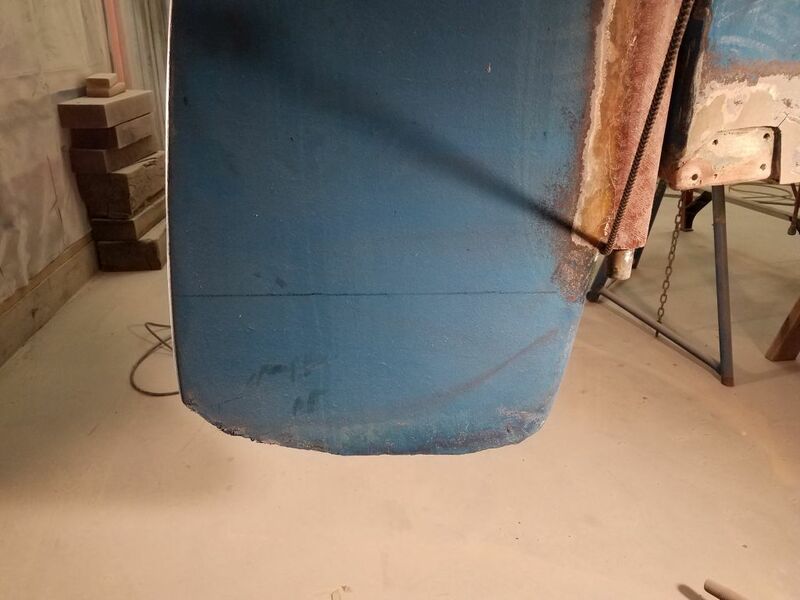 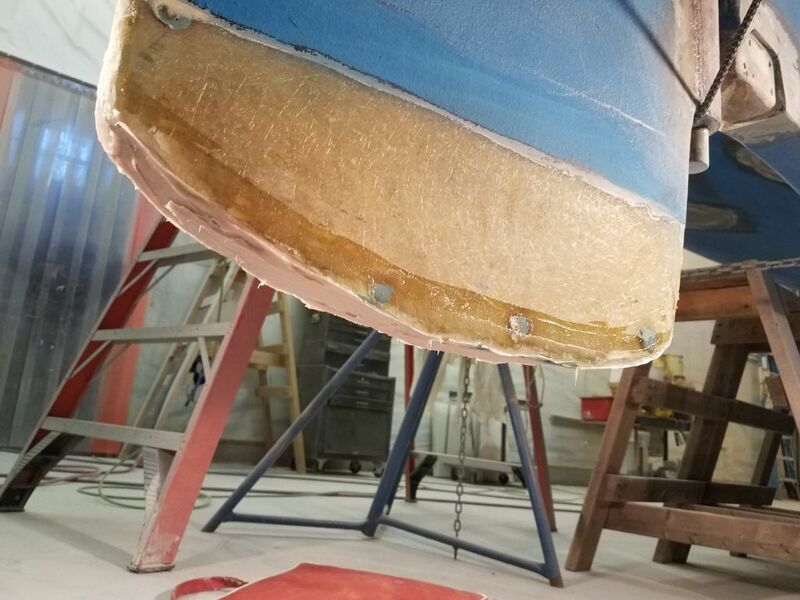 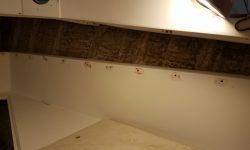 Similarly, I filled some larger fastener holes beneath the foredeck and in the head with the mixture as well, preparing these areas for a layer of fiberglass that would come soon. 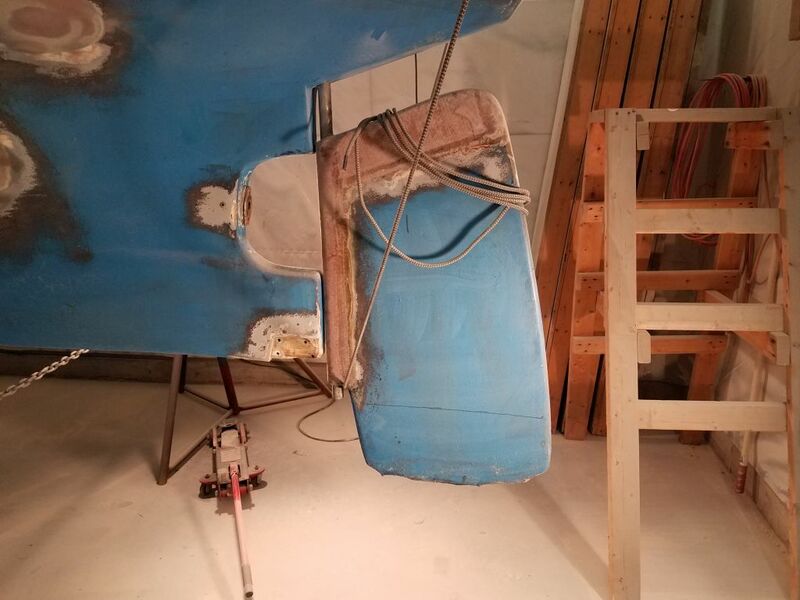 Having taken the interior as far as I could from now, and with some time left in the day, I turned to the rudder. 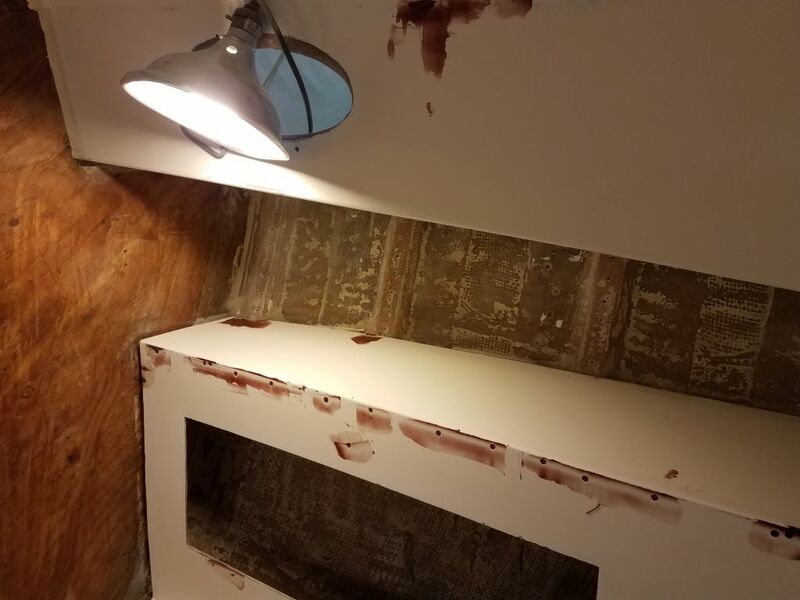 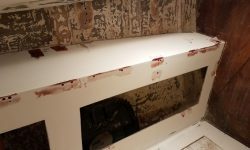 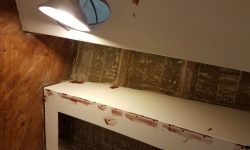 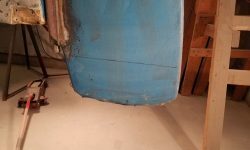 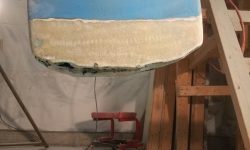 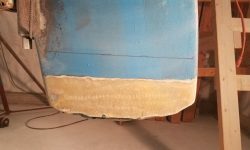 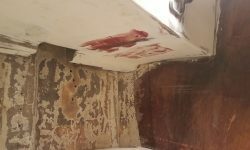 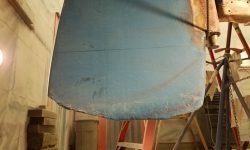 The lower edge of the blade still required some rebuilding and repair, and to begin, I sanded off the bottom paint, barrier coat, and gelcoat with a grinder, preparing a section of the bottom of the blade for new fiberglass. 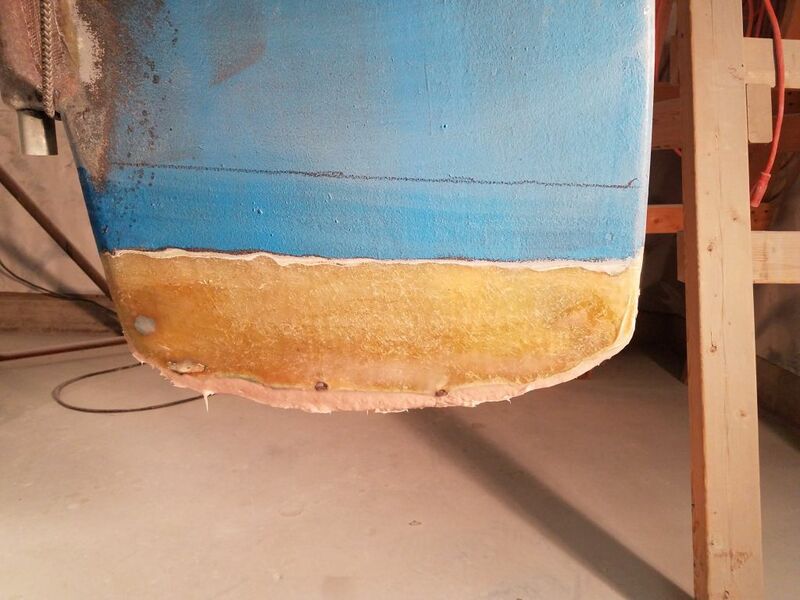 I also cleaned up the mess that passed for the bottom edge to prepare it for filling and eventual reglassing. 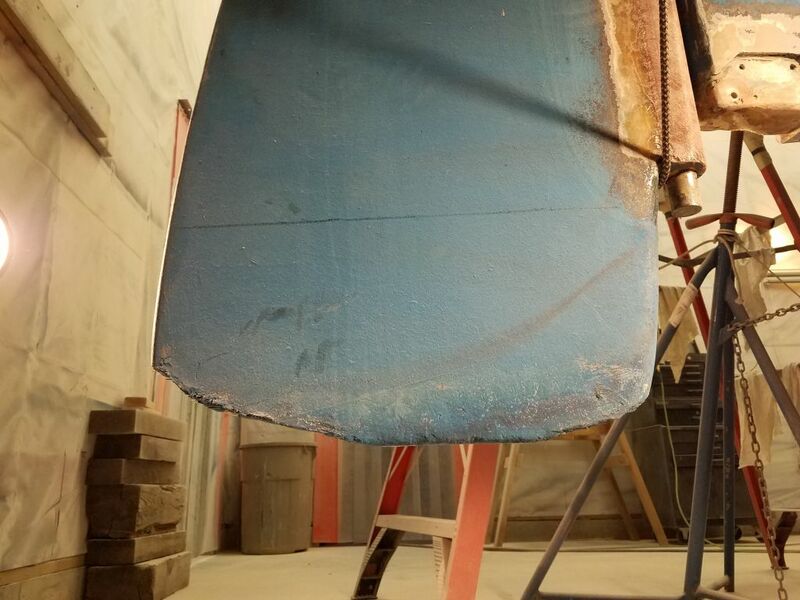 I thought the basic shape left on the starboard side of the blade was more or less how the rudder had been originally shaped, and served as the most raw basis for how to rebuild the lower edge, though in the end I’d judge the final shape by eye as needed. 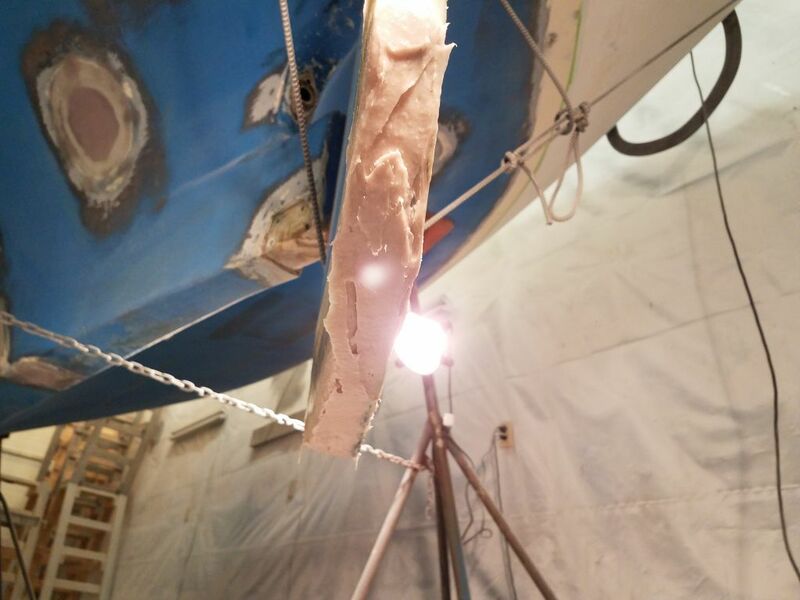 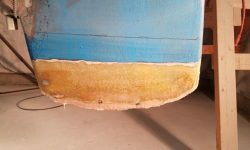 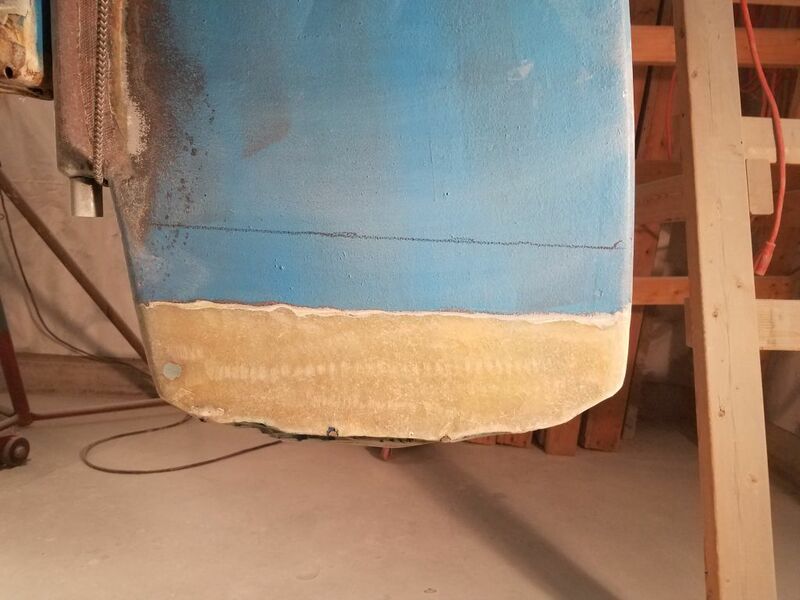 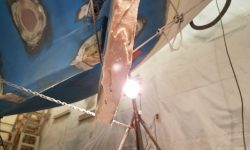 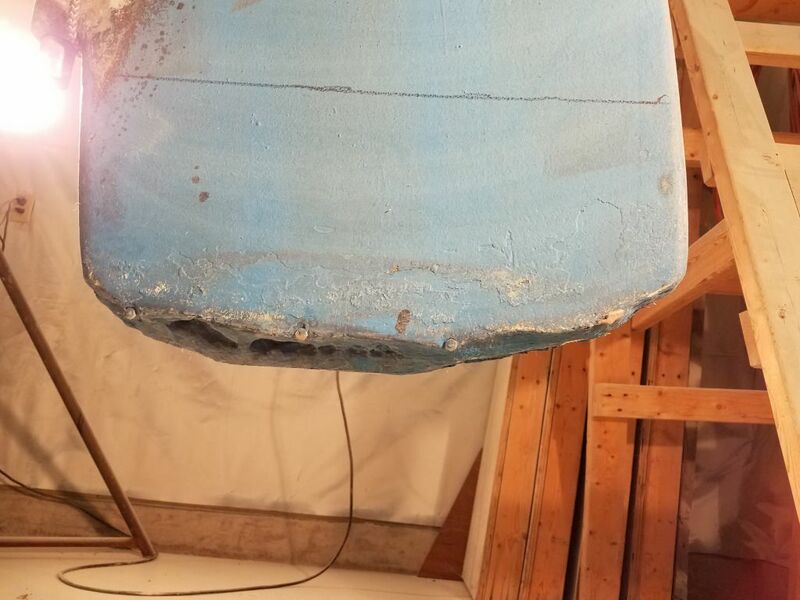 After cleaning up the area, I started with some epoxy thickened with high-density filler, pressing it into the voids between the rudder sides and then beginning to rebuild the shape from there. 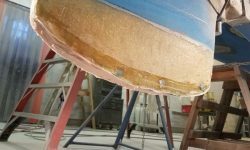 It would most likely take a couple more applications to get the shape back where it needed to be, after which time I could glass over the whole thing to complete the repair. 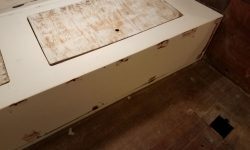 0600 Weather Observation: 31°, snow, about 3-4 inches down so far. 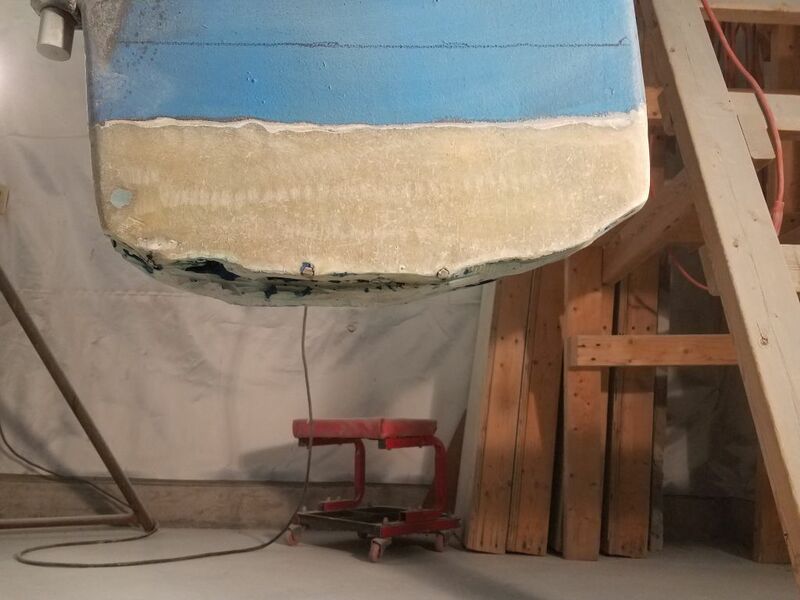 Forecast for the day: Snow ending (about 5-6″ total) and clearing, growing colder with snow squalls.